In April 2019, due to the Ministry of Antiquities of Egypt and the assistance of the Centre for Egyptological Studies of the Russian Academy of Sciences (CESRAS), the Creative Director of ISIDA Project was granted the unique opportunity to visit the construction site of the museum as well as some laboratories of the Conservation Center. The tomb of Khufukhaf I, the son of King Khufu and Queen Henutsen was discovered by George Andrew Reisner - an American archaeologist, who headed the excavations in the royal necropolis at the foot of the Great Pyramids of Giza in the beginning of the 20th century. 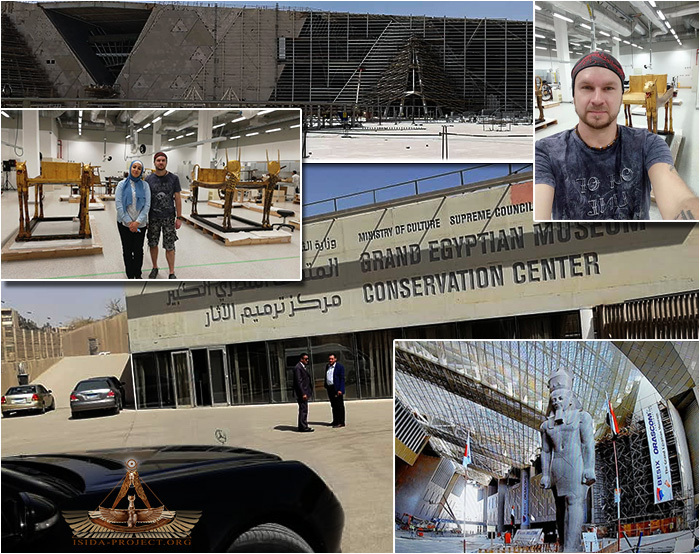 Creative Director of ISIDA Project, Valery Senmuth was granted a unique opportunity to visit the largest archaeological museum in the World - the Grand Egyptian Museum, scheduled to be open in 2020. The visit included several laboratories of the Concervetion Center, the main entrance where the statue of Ramses II is located, as well as the construction site of the Museum itself. The Great Pyramid Owners' Workshop Manual: 2590 BC onwards. ISIDA Project partner, engineer based in France and is currently associate researcher with the CNRS in Nanterre (Paris) Franck Monnier, and PhD in archaeology from the University of Glasgow in Scotland, and a degree in engineering David Ian Lightbody, have published the book: "The Great Pyramid Owners' Workshop Manual: 2590 BC onwards". The book contains photographs, made by Valeriy Androsov (Senmuth) taken during the ISIDA Project expeditions to Egypt. The Administration of ISIDA Project welcomes our new partner - American artist Marcia K. Moore with her project "Our Mysterious Ancestors with Complex Origin: Reconstructing the Story of our Lost History", dedicated to the indigenous population of the American continents. "As an Artist, I am compelled to reconstruct the past using my traditional art tools and modern software technology. It is my hope that by artistically reconstructing and repatriating the past we will understand lost history... Our story... Our true story. A responsibility dedicated to future generations." " Of the home of this being who rose from the dead, and of the position which he occupied in this World nothing can be learned from the texts, but late Greek writers assert that he was a King,and they are probably correct. Only kings and chiefs, or men of high rank, are buried in Africa with the pomp and ceremony which must have accompanied the committal to the grave of the man who afterwards rose from the dead. The exact region in Egypt where his kingdom was situated is unknown, but about his burial-place there is no doubt, for all tradition, both Egyptian and Greek, states that his grave was at Abydos. "